A roaring fire and a comfortable bed used to be all that we needed after a hard day of skiing, but times have changed. We still want that comfy bed and would love a wood burning fireplace in our private suite, but the most discerning traveler is now also looking for the luxury of a private hot tub. 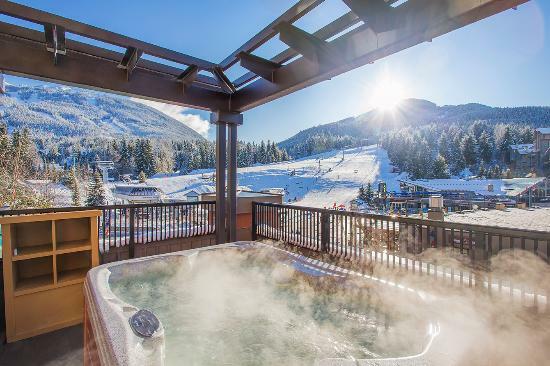 Most Whistler hotels have a communal indoor/outdoor hot tub and some with a pool as well, however finding that private hot tub in your own suite can be challenging. We’re here to let you in on the best kept secrets. One of the finest hotels in Whistler with prime location right in the centre of the village, comes with fully equipped suites and a select few with private hot tubs. Soak in the views of the bustling village below or the majestic mountains above from your private balcony while giving your tired feet a soak in the hot tub. Located in the quiet area of Village North, close to the Tennis Club, IGA and numerous shops and restaurants, you are at the center of it all without the noise from the main village stroll. Almost all units come with a private hot tub on the small outdoor patio ranging from 1 to 2 bedroom suites. Either in the Lagoons, Northstar or Sunpath, you’ll find several larger units with private hot tubs on their balconies. An older complex, but with fantastic rates. Beautiful units great for families or groups of friends, fantastic location with ski-in, ski-out access and private hot tubs looking down to the slopes make these the most desirable in Whistler. Nestled in the quiet Upper Village with ski-in, ski-out access during peak ski season, a few of these units have private sunken hot tubs looking out to the lush forest above. These are just a small selection of Whistler Condos with private hot tubs, so be sure to do some detective work and see what’s out there. Tip: Book by November 15 & save up to 45% on your ski vacation.